As we talked about in the previous video, Chopin’s etudes are among some of the most difficult piano repertoire. They’re an ARCT level through the RCM, which is as high as it gets. But sometimes it’s fun to play famous songs without playing the crazy-hard full version. In today’s video, we’ll discuss the piece, listen to it, and work on some finer points and details in the music itself. First things first: Backstory time. Chopin’s collection of etudes (op. 25) were published in 1837. This 11th etude in A minor is, in its full, unsimplified form, a work of endurance. There are huge leaps in the left hand, intense fortes, and a constant chromatic right hand that moves very fast. Fun fact: The simple, slow introduction wasn’t originally included in the etude – a friend of Chopin convinced him to add that in there. I think it pulls the whole thing together. Good job, mystery friend! Let’s take a listen to the the etude in full, so you can get a sense of how intense it is. If you’re familiar with Chopin, you probably know his “Revolutionary” etude, op. 10 no. 12. This piece is basically the inverted equivalent. Revolutionary uses fast running passages in the left hand (as opposed to right hand in this one), and requires plenty of intensity and endurance. The first thing I want to do is make a list of all the terms used in this song, as well as their meanings. There is plenty of articulation, dynamics and details to pay attention to here. I want to briefly discuss the rhythm in this piece, as there are some strange 16th note patterns. When we have 16th note sections, it’s best to count in increments of 16th beats. So when we count 1 2 3 4, we’re counting in a quarter note beat. When we count 1 + 2 + 3 + 4 + , now we’re counting an 8th note beat (by adding a +). When we count 1 e + a, 2 e + a, 3 e + a, 4 e + a, suddenly our count is in 16th notes. 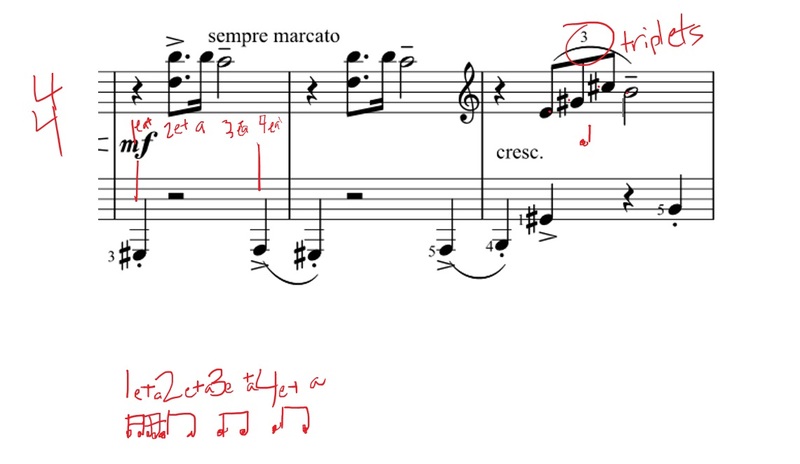 So I would write in the counts for tricky bars like this – so you can visualize from the left and right hand – and then tap out the rhythm with both hands by counting aloud, or in your head if you can do that. “Blue – ber – ry pie” – which is the sound of a triplet with a quarter note at the end. The clef in the right hand jumps around a lot. I did this so the notes are easier to read – otherwise we’d be dealing with tons of ledger lines everywhere. 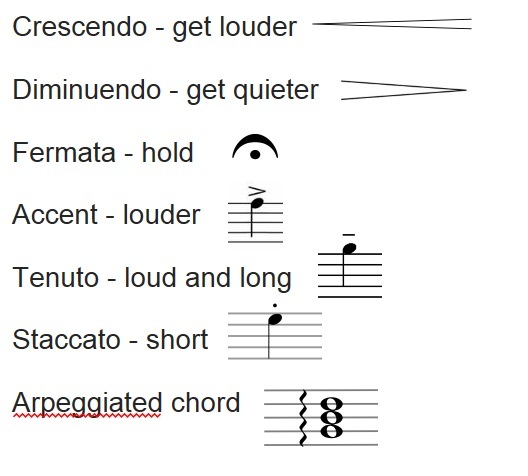 Stay aware of the spots where the clef switches. So when it switches to the bass clef, it means that suddenly you’re reading those notes lower, and you read them like you would for the left hand (but you play the right hand). It’s interesting to me how Winter Wind by Chopin changes keys. We start in C major (you can see the CEG in the opening notes), then when the real tune begins, the A minor chord is obvious. Later, when the same part repeats, it’s in the key of E minor. So this song modulates to a closely related key, the one that’s 5 notes away (A to E). Then we have these wacky, almost jazzy sounding sections, where we move from a D diminished chord to basically an F minor chord. 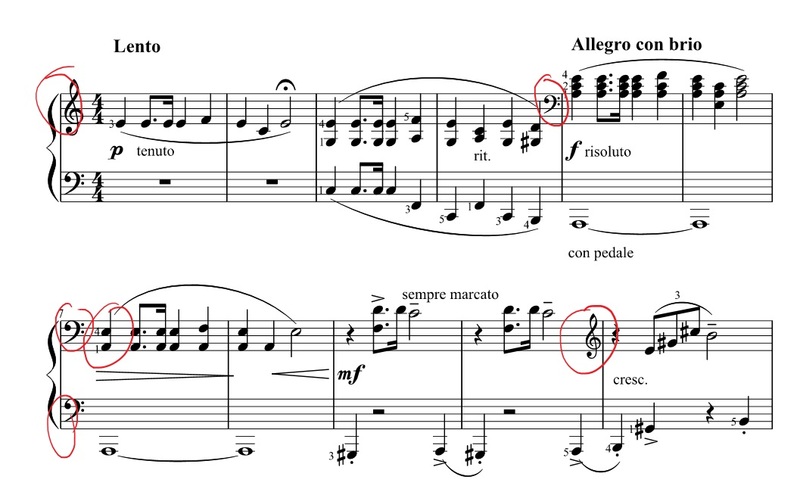 If you’re nerdy like me, you’ll have fun combing through this one, and finding all the random and interesting chord combos that Chopin favored here. And that concludes today’s tutorial on Winter Wind by Chopin (etude op. 25 no. 11). Even the arrangement I’ve made isn’t particularly easy (though it’s leaps and bounds easier than the original), so just be sure to have some basics mastered before attempting this one.